Sliding Axle Trailers - Kingpin Trailers LTD. Trail King’s Advantage Plus! 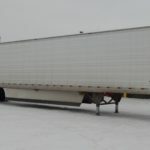 Hydraulic Sliding Axle (SA) trailer has become the “go to” choice for hauling professionals who are looking for dependable load-hauling strength, durability, and versatility. The SA features a low load angle, greater payload capacity and stability, more corrosion protection of critical components, and smoother, more precise operation. The Trail King Advantage Plus! 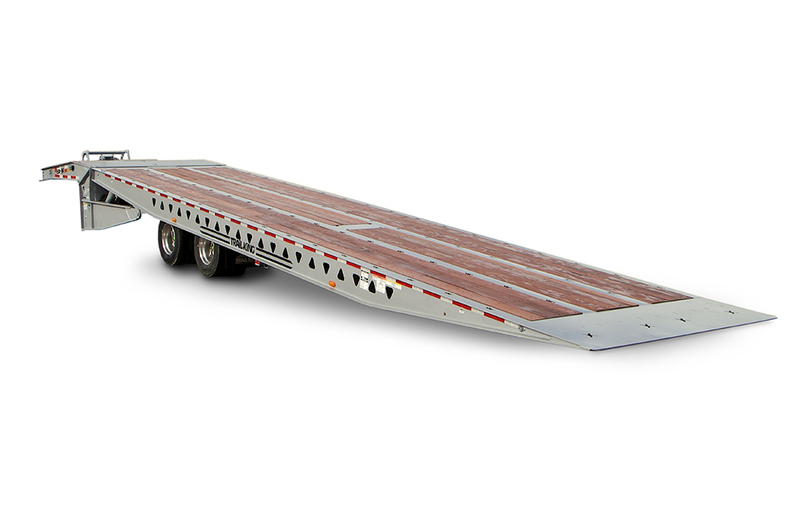 SA… destined to be the best sliding axle trailer you’ll ever own. Even disabled equipment can be loaded with ease with the standard 20,000-lb. winch, which comes standard with winch guard. Standard front access panel offers easy access for connecting hydraulic, air and electrical lines. The panel may also be opened for internal maintenance or repair simply by loosening four bolts. As the axles travel, the deck rides securely on 4″-wide rollers that are centered on the main beams, preventing flange damage common in offset designs. A special flexible chain track encases and protects traveling air and electrical lines. Because the powerful side-by-side 2-stage cylinders are in the closed position during transport, the cylinder piston rods are protected from road grime and debris. Backlit push button control pad with LED indicators is conveniently located on driver side to control hydraulic and air functions. (Dual-side hydraulic controls optional.) Full-function remote is standard equipment. Two-way tie downs (with optional stake pockets below) on all main beams and 4-way slots in the 3/8″ high-strength smooth steel approach plate (inset photo) provide almost limitless tie down options. Also note how the deck is double-screwed to all cross members to prevent cupping. Easy access grease points in the tail channel as well as along the sides of the trailer make greasing the entire trailer, including axle components, rollers, and cylinder pivots, a simple, convenient process. A recessed roller at front of deck and a skid plate on the slope of the upper deck protect both the winch cable and the deck of the trailer from damage during loading and unloading. The perimeter frame delivers maximum strength and stability during loading and unloading. 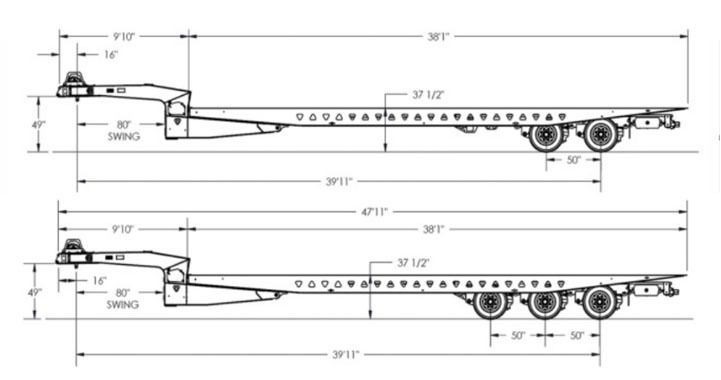 The design also includes an undercarriage to protect air lines when the trailer is in the transport position. I-beams are constructed of one-piece web and flange material and welded on all four sides to seal and protect the seams from rust. 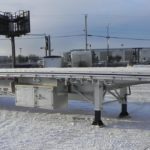 The entire trailer is primed and painted before decking and air, hydraulic, and electrical lines are installed, for complete protection even in places you can’t see. 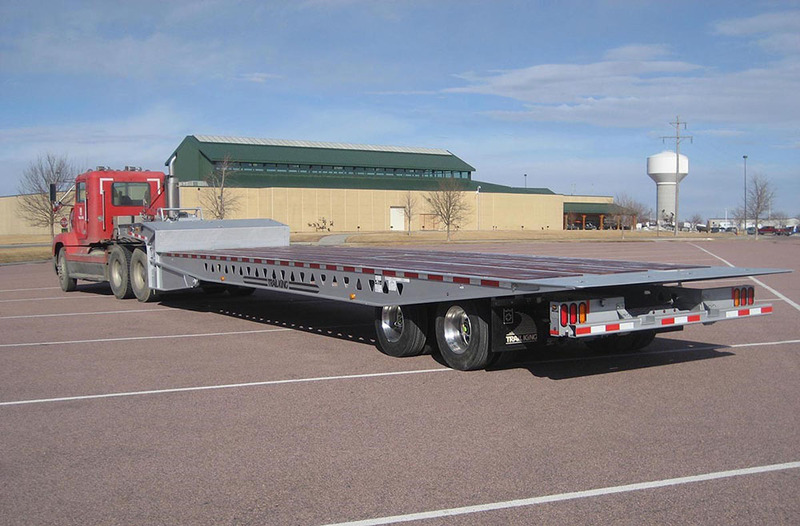 Provides required under-ride protection while trailer is in transport position. Bumper travels with wheel area as it is positioned to allow the deck to be lowered to a low 6 1/2° loading position. Three light package standard. Strobe light optional. Capacity: 80,000 lbs uniform 50,000 lbs in 10 ft. 110,000 lbs uniform 70,000 lbs in 10 ft.